What is a Proxy Measure? Benchmarking is the process of continuously comparing and measuring an organization against its own past performance or comparing its performance to that of another comparable organization. A benchmarking practice provides information that will help an organization take action to improve its own performance. Governments of all levels of capability can leverage benchmarking in their performance management practice. This short guide explains benchmarking using practical examples and provides quick links to helpful benchmarking resources. The guide also describes the related practice of using "proxy measures," which are another useful tool in the performance management toolbox. 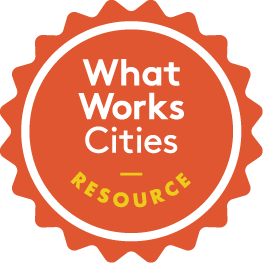 The Center for Government Excellence at Johns Hopkins University (GovEx), a partner in Bloomberg Philanthropies’ What Works Cities initiative, created this practical guide to help governments advance performance management practices by leveraging benchmarking and proxy measures. The guide includes: definitions of commonly used terms; real examples of benchmarking and proxy measures in practice; and a list of useful resources.